Hero True Wireless Bluetooth Earbudss by Winnergear are surprisingly light weight, good sounding, and very comfortable. 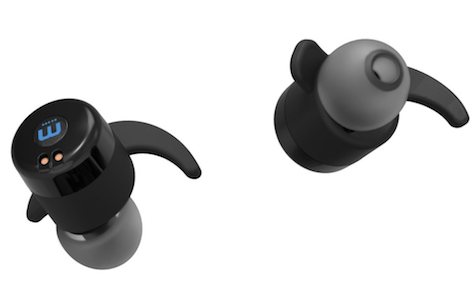 Hero earbuds are supplied with a charging box, a USB charging cable, left and right ear pieces, plus three sizes of ear tips and two sizes of ear hooks. The storage container is a portable charger that will charge the earbuds when they are placed in it. This is a stand-alone charger that will charge the earbuds several times before it needs charging using the USB cable. It’s a very compact system and the earbuds charged in less time then the rated 90 minutes. The play time is rated at three hours, with standby rating of 12 hours. Hero is sold for a reasonable retail price of $150 U.S. The sound quality is good, and when I’m using these buds I’m usually doing something other than listening intently to music. I’ve ridden my road bike and went for a 5k run and Hero performed nicely. When I just sat and compared the sound quality with other in-ear headphones in my home, Hero were lacking in clarity and bass response. 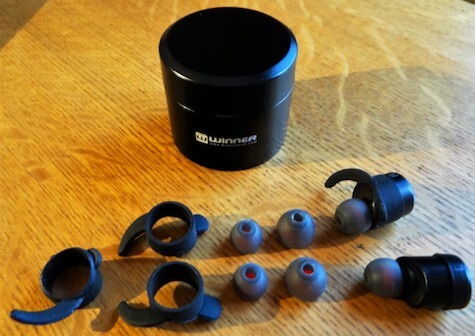 When exercising, walking around town, or driving and using them as a hands-free option they work great and I’ve got no complaints with the audio performance. I was impressed by the Bluetooth 4.2 range. While doing a little yard work I could move throughout much of my yard and not loose the signal from my old iPhone4 that was sitting in the sun room. As with most products there are some issues. The instructions do not have the best translation, and there were also some errors. When you play around with the minimal music controls you can figure it out. Pressing either left or right power button will pause/unpause the music; double clicking either button will advance to the next song. and that’s it. There is no volume control. You must have the ear hooks aligned correctly on the earbuds so that they will align into the charging station. After wearing the them for about an hour the left ear hook became uncomfortable so I removed it and even without the hook it stayed in place very well. It was still easy to align the earbud into the charger without the ear hooks. The play time with a fully charged set was just under three hours of constant music with two brief phone calls during that time. You can power on only the left to use as a hands free phone option (the left side has the mic). I’m not sold on Bluetooth earbuds. You need to keep them charged and they have a limited battery life. Both of these are problems for me. I have a difficult time keeping my phone charged and I often go for a hike or an extended bike ride of over three hours. Neither of these activities requires the wireless option. I will be using these versatile Hero buds for other activities like gardening and working out in the gym. So they do have their place. I would rate these a 6 out of 10 for earbuds in general. 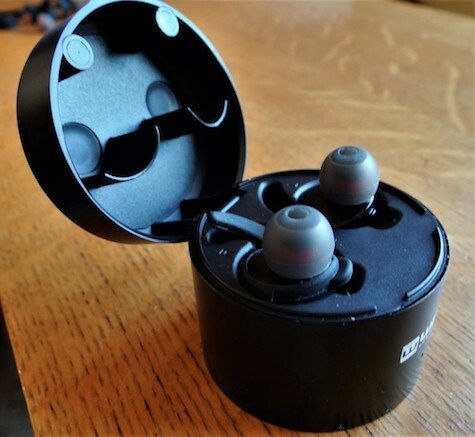 In the wireless earbud category it gets a favorable MyMac Review Rating of 8 out of 10, because of the great fit and the portable charging station. Hero by Winnergear is a good sounding, very comfortable fitting, sweat proof, totally wireless earbud option that’s well worth looking into.